I’ve seen some appalling advertising over the years, but the ad campaign Wrangler is currently running in France takes the prize for being just about the most tasteless, sick and twisted advertising, in the history of the world, ever. 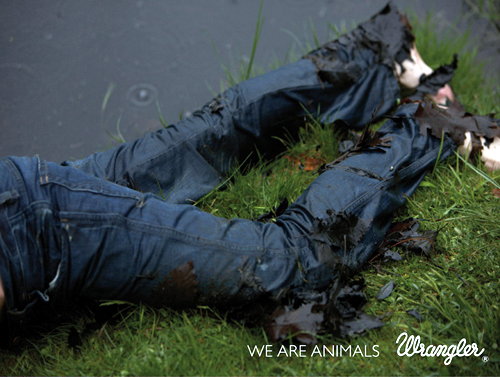 We Are Animals? Yes Wrangler, I think you are. What on earth possessed anyone to think that this was a good idea? Hat Tip to Melissa McEwan who covered this over at Shakesville. Oooh but it’s all just soooo ironic Jennifer and therefore justified. You see if anything is offensive all you do is wave the ‘irony wand’ over it and magically it is ok. Unless it’s insulting religion of course. That’s never ironic. I concur, it is sick. Hey, you guys have been so fast to complain about this ad that you havent even bothered to look at the ads and understand them. It has nothing to do with male violence against women, it is simply a nod towards the fact that we are all, as human beings, animals! The two images are putting humans in situations that you do not expect to see them in – i.e. roadkill or stuck in an oil slick. Now if you think this is sick from that point of view then fair enough – i think it is unecessarily shocking imagery – but at least try to understand the ad before you condemn it! Looking like a young, hungry, tough, animal is one thing. Looking like a corpse is quite another. Yes, death is part of the life cycle, but everyone knows that a young, beautiful corpse floating in water means that, probably someone murdered them. 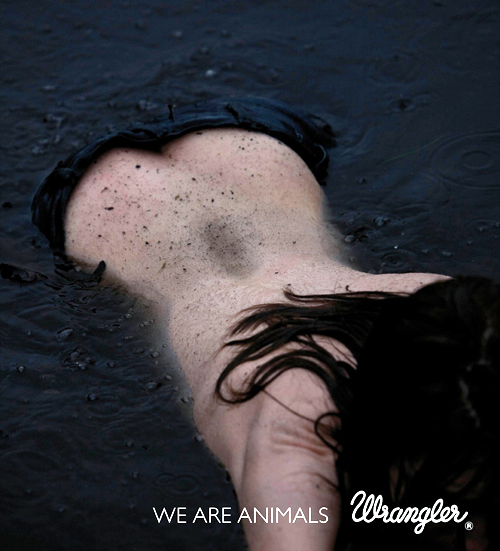 Wrangler know it, we know it. That’s great. Wrangler Jeans hopes you get murdered in these jeans, or at the very least, tragically killed. So tasteful. Greg, this is an advert to sell clothes. The woman is naked. And dead. but at least try to understand the ad before you condemn it! Yeah. That is exactly what we did. Understand the meaning behind the images, then condemn it. Nice try at mindreading though. Don’t give up your day job. For all of you, nobody is dead here and nobody saying that women are animals. This has nothing to do with irony either.